Florence is the capital of Tuscany and is widely known for its importance during the Renaissance period and the Middle Ages. The city holds many treasures of Renaissance art and architecture. Every year many tourists flock to the city to admire this historical and cultural heritage to have la Dolce Vita. As a tourist, there are several important sights and monuments that one simply can’t miss when staying in Florence. Among them certainly are Michelangelo’s David at the Galleria dell’Academia, the Galleria degli Uffizi, the Ponte Vecchio or Il Duomo, and Cattedrale de Santa Maria del Fiore. The main objective for people who visit Florence is to see as much of the monuments and sights the city has to offer. But, this sure can be exhausting as well, especially if you are only staying for a couple of days. The Italians are known for living “la dolce vita”, literally translated the sweet life. So, Italians do not want to abandon their right to a little fun. 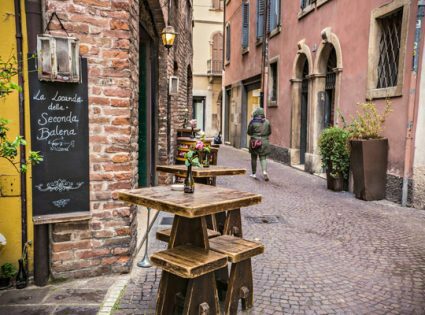 After a day of sightseeing, visiting galleries and museums, you have to sit down for a well-deserved drink and a good meal and if you are in a beautiful city like Florence, it shouldn’t be at any bar. When you sit in this bar/restaurant you will have an excellent view of the Ponte Vecchio. The restaurant is most famous for the pasta dishes. You will dine with live Jazz music playing and also you can enjoy artwork from European artists that have a special relation to the city of Florence. The iconic American Bar is famous for its excellent service and the good food. The barman, Leo Valdorini, is a little legend and celebrities from not only Italy but all over the world have eaten at this place already. This place is historic in its own rights. In total, this place is a bar, an art gallery, and a wine bar. Like the name already gives away you come here to enjoy the good life. People love to come here to enjoy a drink during happy hour. Emerging artists get to exhibit their work in the exhibition space. And you can choose from the best national and international wines. If you visit Tuscany and rent apartments in Florence you certainly will get to know the classical Firenze that appeals to the many visitors but don’t leave out the chance to get to know the contemporary Florence. Step into one of the restaurants/bars to find out what Florentine life today is like.